The morning of our departure we left our stay in Rwanda to hire a motorcycle taxi just two kilometers from the border. With a sense of excitement and anxiety, we had no clue what to expect. We were entering the Congo after all. 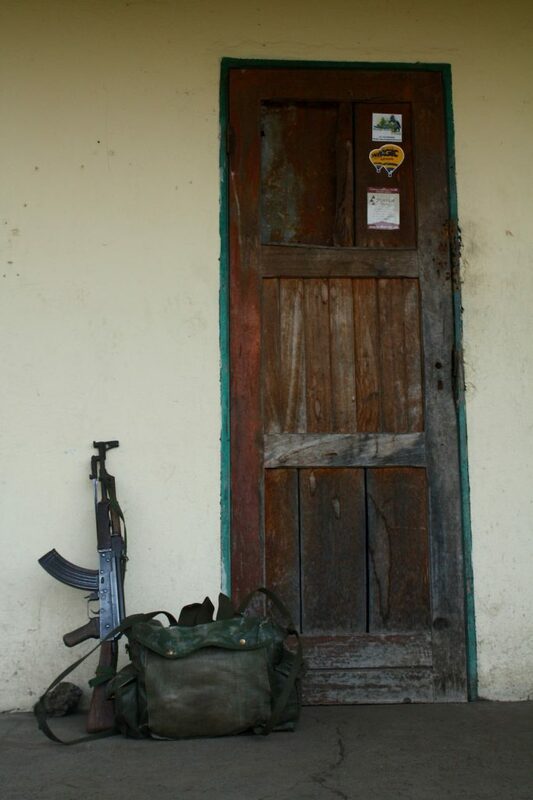 From our backpackers, it was a 5-minute drive to the border post known as the Grand Barrier. While there were many resemblances of a normal border crossing, there was also something mysteriously different about it. From the barbed wire, several motor blockades, and military soldiers who looked more like militiamen ready for combat armed with machine guns, it was a scene forever in our memory. Soldiers stood every few meters scanning people up and down. With our paperwork in hand, we first got an exit stamp from Rwanda. 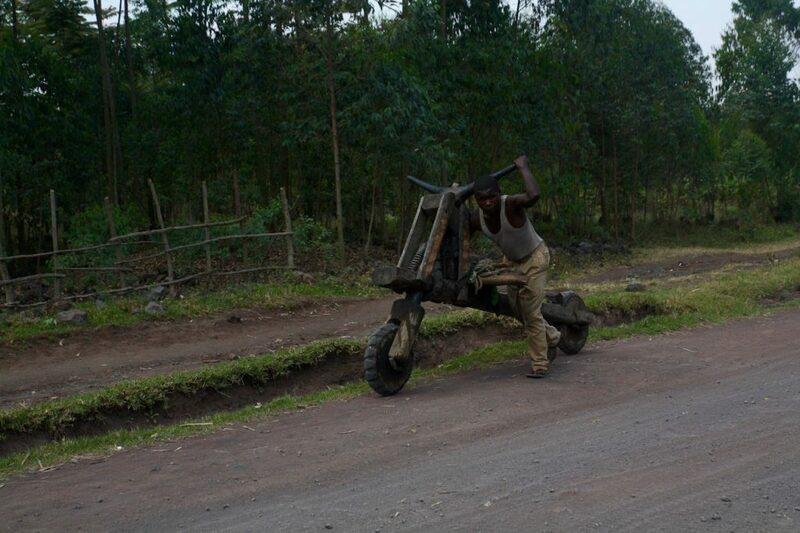 Instructed to walk to Congo, we pass several military checkpoints all asking for our documents. With approval, they push us on to the Congo passport control. We were all set up for our trip to Virunga National Park, all we needed was an entry stamp into Congo. Or so we thought. We walked across the border and now officially in Congo, there is another security checkpoint. Following the checkpoint is a long line for an entry stamp into the Democratic Republic of Congo. A soldier comes up to us, rifle in hand, asking for our papers. We hand him the visas that we received the day earlier. He asks for our yellow fever cards, those yellow cards proving you are vaccinated. Silence. Yana and I look at each other with dry throats. Paranoia rushes in. We forgot our yellow fever cards. I tried to explain that we left our yellow fever certificates at our hotel in Rwanda with the rest of our belongings. The solider has an intimidating blank stare. Two words were exchanged with us, not knowing our fate. 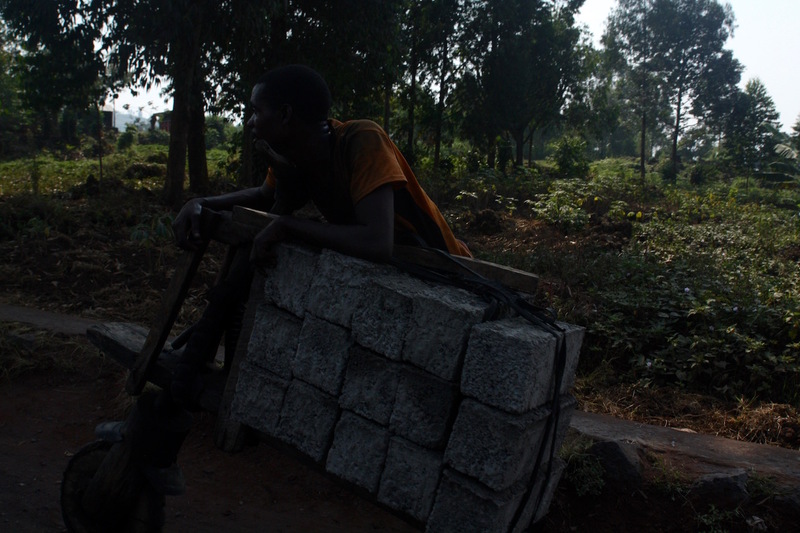 “Go fetch.” Yana remained at the border post and running like a banshee, I return to Rwanda. I yell for the first moto-taxi available, hop on, and rush back to our hotel. Minutes later, my paranoia turns into ice-cold fear. I just realized, I ran through the Rwanda border control without talking to them, and never got an entry stamp back into Rwanda. I am technically in Rwanda illegally. With some tension between Rwanda and D.R.C., my mind wanders about what could happen if I were to be questioned on the Rwandan side when I return. I quickly grab our yellow fever cards and return to the border. Only fifteen minutes pass, but it felt like an eternity. I was sweating bullets, unsure if was from the 95-degree heat or the fear of what might happen when I return. At the border, I don’t make eye contact with any Rwandan military officers. I walk directly to the border hoping to act as if I just got my exit stamp. I thought I was clear until a soldier from Rwanda stops me at the last post. He asks for my passport and flips through it. He looks at me with a blank stare and after a slight pause, he hands me back my passport. Disaster diverted. I enter Congo again. Now I have all the documents needed, and I find Yana standing next to one of the customs agents. She waves me over with a look like what the hell just happened. After a few panic attacks and a sweat-stained t-shirt, we finally made it. We are in the Congo. Congo, officially known as the Democratic Republic of Congo, has always had a mysteriousness about it. This war-torn country has always been in the dark shadows of Africa, where every few years a rebel group threaten the safety of locals and tourists. Just across the border from Rwanda in the quiet lakeside town of Gisenyi, the city of Goma bustles to life. U.N. soldiers have been stationed in the D.R.C. and Goma since 1960. There now are still over 18,000 UN peacekeepers and soldiers stationed in the D.R.C., with 8,000 in Goma. This is the largest U.N. mission anywhere in the world. It was a strange sensation seeing all these soldiers. Nearly 80% of the vehicles we saw were U.N. vehicles, most of them armed. Every corner has towers with soldiers stationed in them. With all these soldiers around us, it was a mixed feeling that we were safe, or were we not safe? How You Hike in the D.R.C. Very few tourists come to Congo. When tourists do come to Congo, they typically obtain a visa to come to see the mountain gorillas or to hike the Nyiragongo Volcano. Both of these are located in the Virunga National Park, just outside of Goma. It is common for tourists to come to Goma for one day, go on their tour, and leave the Congo directly upon the completion of the tour. We figured since we were already here, we should stay for one extra night. Surprisingly, the center of Goma was very safe. We could walk around at night, and unlike other areas of Africa, did not have to worry about theft (or so we were told). To be completely clear, the situation in Congo always changes. It could be safe for one month, or even one year, but tensions are constant and it could become a dangerous situation quickly. When we were there in 2016, there were no conflicts at the time. However, recently in 2017 and 2018, there have been attacks and safety is becoming an issue again. Please check with your government as to the latest situation in Congo. Contacting the Virunga National Park is also a good idea to find out if they are doing tours and to ask about the safety when you expect to visit. A good budget hotel in the center of town is Tony’s Guesthouse. Rooms start from $20 up to $35. Cost is $100 for a 14-day visa. You can get visas from the government directly or through Virunga National Park. The visa process should take 2 to 3 days to process. 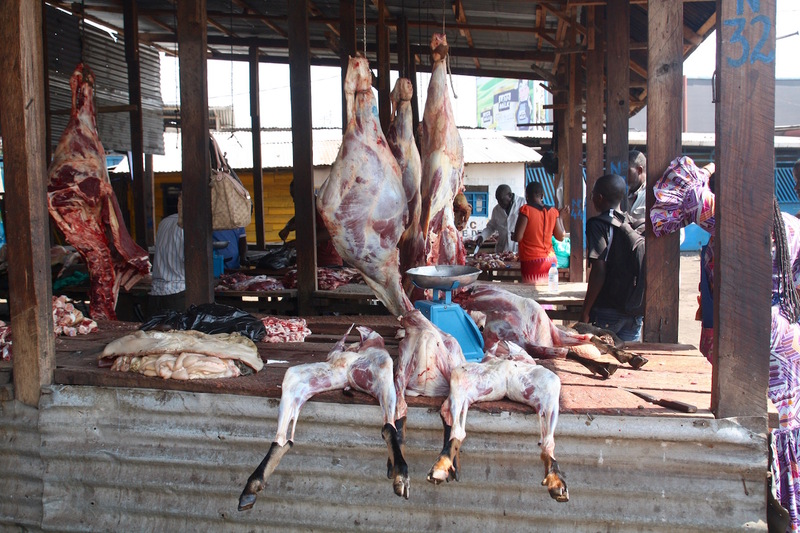 Food is very similar to Rwandan food where during the day you can find several basic lunch buffets. For $5, you can have an enormous plate of rice, potatoes, cooked plantains, french fries, spinach, and one meat option, typically goat. Restaurants are commonly priced between $5 and $12 for a meal. The Grand Barrier border crossing is open from 8:00 AM until 7:00 PM every day. It is not possible to enter the D.R.C. outside of these times. Access to Virunga National Park is from Goma, D.R.C.. It is a 30-minute drive to the park. You can pay for transport with the national park or they can recommend a private transfer. The NP transport includes an armed guard during transport. If you are coming for a gorilla trek, the park transportation leaves Goma for Bukima, where the trek is, at 6 AM. Thus, it is not possible for the same day entry to Goma and the Gorilla Trek. You must enter the day earlier and stay the night in Goma. Transportation for the volcano trek picks up passengers at the border at 8:30 AM and the trek begins at 10 AM. Transportation for the gorilla trek costs $94 each way and for the volcano trek costs $28 USD each way. The park will recommend a driver for private transfer if requested, which should cost around half the price. Due to several incidents in 2018 as well as the death of a park ranger and kidnapping of two British tourists in May 2018, the park is closed until further notice. The park has publicly stated they are reviewing their security measures and will assess the crisis of militia in the region before opening the park to tourists again. In the Congo basin on the eastern part of the country is the Virunga Mountains, where there are several volcanoes, large lakes, and rainforests. 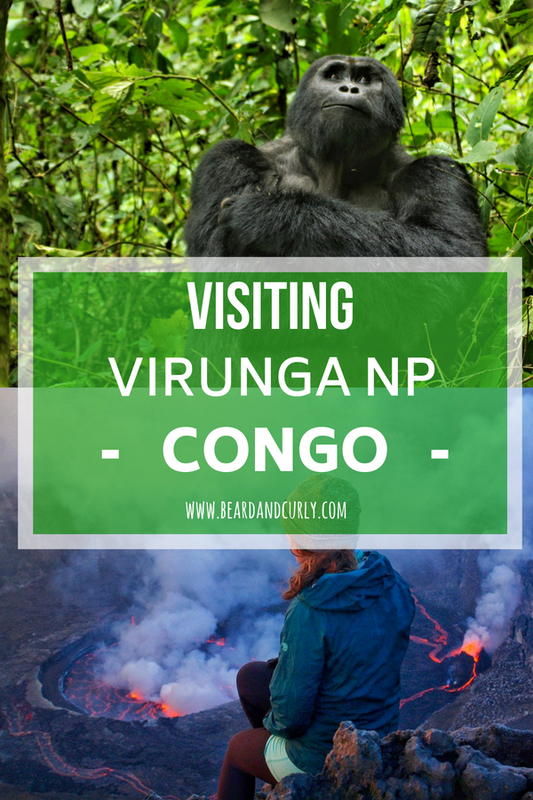 There are two main activities when going to Virunga National Park. The Virunga Mountains which extend from Congo into Rwanda and Uganda is the last remaining place in the world home to mountain gorillas. Gorilla trekking is one of the main activities within Virunga National Park in Congo. Virunga is also home to the worlds largest lava lake at Nyiragongo Volcano. You can trek to the top of the Volcano and stay the evening in a basic hut while watching the night glow at one of the most remarkable sights on earth. Virunga NP in Congo has 9 families consisting of 153 mountain gorillas (and growing) in the wild. Congo is the cheapest place to go on a gorilla trek. There are two rainy seasons, between March through May as well as October and November. It is best to go on a gorilla trek for the rest of the year during the dry seasons. 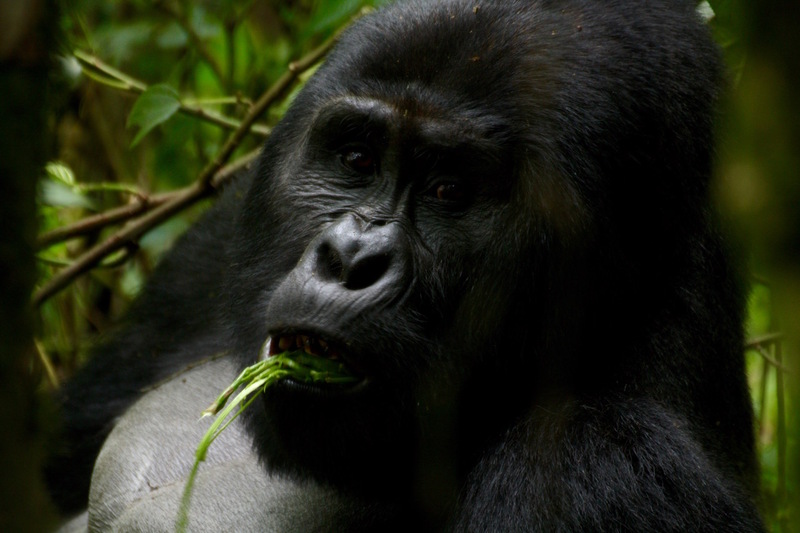 Unlike treks in Uganda and Rwanda, gorilla trekking in Congo does not book up. It is easy to get permits as well as setting up last-minute trips. While we were in Goma, it was possible to set up a trek for the following day. 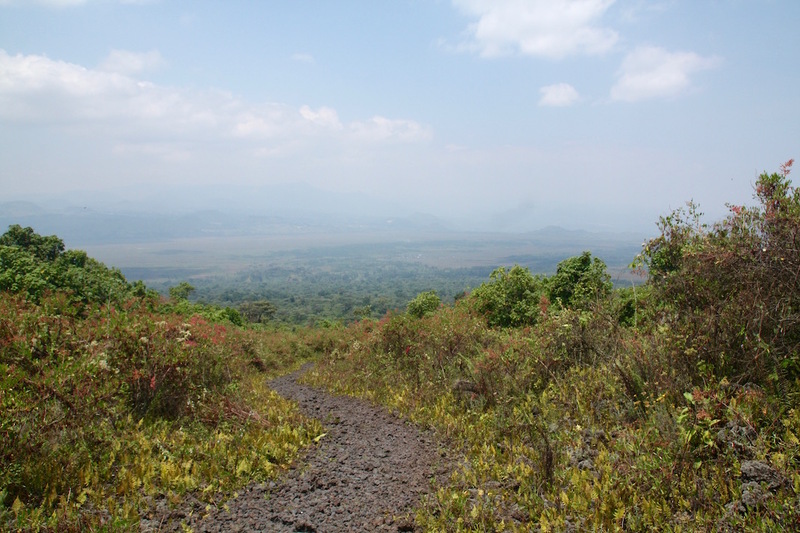 Because of the low tourism to Congo, there are minimal crowds while trekking. The time on the trek itself depends on where the gorillas are. Trackers will be ahead of the group looking for the gorillas. It could take under one hour or several hours getting to the gorillas. Once the group is with the gorillas, one hour is spent on this incredible experience. The cost for a gorilla trek in Virunga NP is $400 USD. Check out our blog post on How to Pick a Gorilla Trek in Africa for more details. 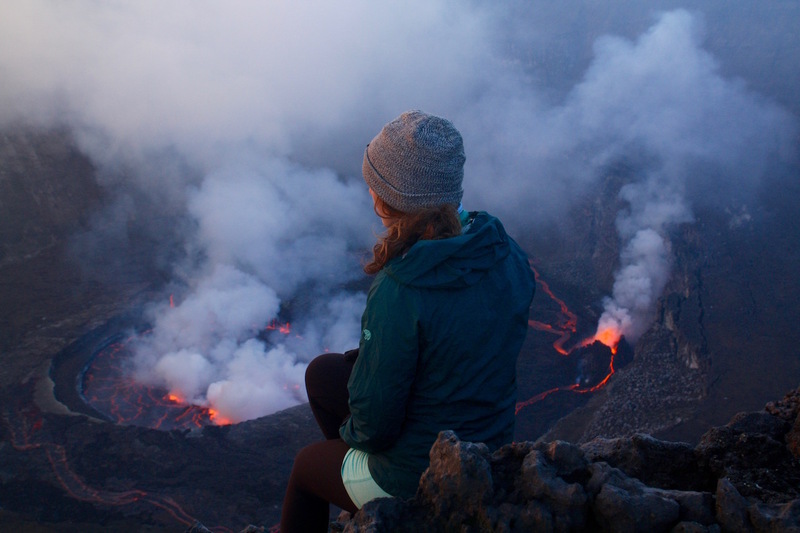 The Nyiragongo Volcano is one of six volcanoes in the world with a permanent lava lake. The others are Kilauea in Hawaii, Ambrym in Vanuatu, Erta Ale in Ethiopia, Masaya in Nicaragua and Mount Erebus in Antarctica. Nyiragongo has the largest lava lake of the six. 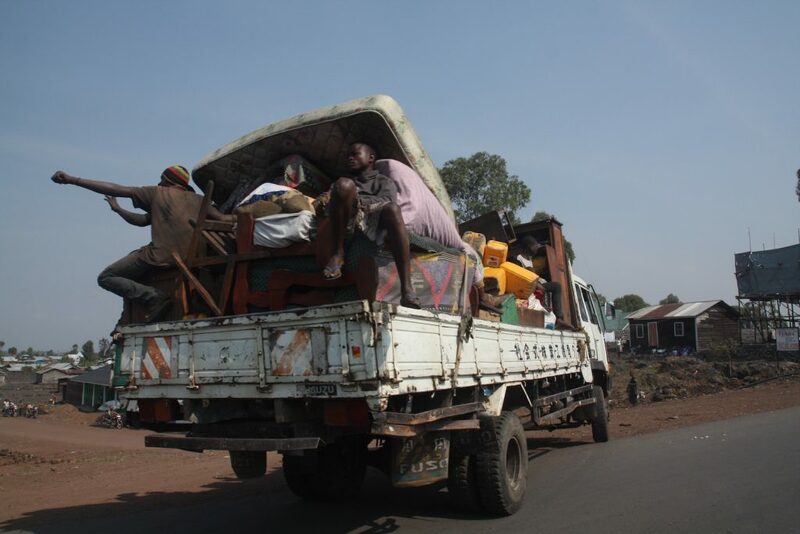 It is 12 kilometers from Goma, home to 1 million people. The hike is relatively easy for anyone fit or experienced with hiking. It takes five hours, but only because of mandatory stops every 45 – 60 minutes. It should take 3 hours to climb. On the hike, you are escorted by two armed guards, and you can hire a porter for $25. There are small huts at the top of the volcano which only sleeping mats are provided. You will watch the sunset and witness the volcano come to life. The glow and thunderous noises of the volcano make it a night to remember for the rest of your life. This was by far the coolest thing we have EVER done. Permits to hike the volcano cost $300 per person. 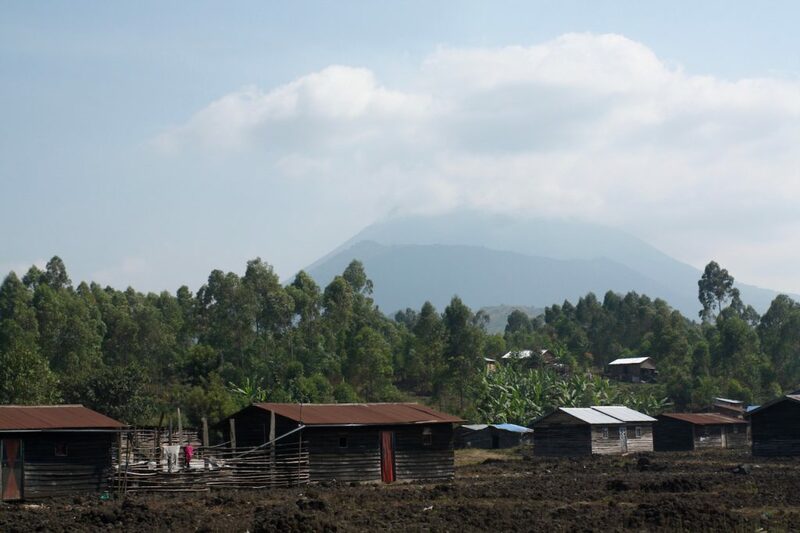 To read more about our trek, check out our full blog post on the Nyiragongo Volcano Trek. Chimpanzee Walk – If you are staying at Mikeno Lodge, you can take part in a daily chimp walk at 6 AM. Walks are booked on site at Mikeno Lodge and only take 4 guests at a time. One hour is spent with the chimpanzees. Cost is $100 USD. Mikeno Lodge – For a luxurious night in the jungle, the Mikeno Lodge has views of several volcanoes and many native monkeys in the area, including chimpanzees. Cost for a single is $330 and a double is $475. Accommodation includes all meals. Rwenzori Trekking – The Rwenzori Mountains are some of the most isolated, remote and incredible mountains in Africa. Summits reach heights of 16,761 ft (5,109 m) and the mountains are home to Africa’s largest and oldest glaciers. These hikes are for experienced hikers and are typically 7 – 10 days depending if you summit Margherita Peak. The best time to hike is between January and mid-March or June through August. Permits cost $200. Guides and porters also must be hired, inquire with Virunga NP on options and prices. Tchegara Island – Enjoy time on this Lake Kivu island with views of several volcanoes. Rent a kayak and enjoy some lake time. Permits and boat transfers cost $100. Single rooms cost $160 per night and double rooms cost $216 per night. Rooms include all meals. For more information on all activities included in this post, check out the Virunga National Park website. For the volcano trek, you will need to bring a full-size pack with hiking gear. The summit of the volcano is at 11,382 feet (3,470m). The temperatures routinely are below freezing at the summit. Ensure you bring proper cold weather clothes and a proper sleeping bag rated at 0°C/32°F. Packed meals and all gear is available for rental through the park if needed. There is no water at the summit, so if you do not buy a meal plan, you must bring enough water for two days. The gorilla trek is only a day trek, so only the hiking clothes, a daypack, water, lunch, and rainproof jacket is enough. Don’t forget your camera with charged batteries, these will both be the trip of a lifetime! Sports bra: Yana lives by Lululemon sports bras. The Free to Be is a classic. Down jacket: Mountain Hardwear Ghost Whisperer jackets and their women’s jacket are compact and warm. Another great option is the Women’s Patagonia Nano Puff. Plate or bowl: BPA free silicone collapse bowls are lightweight and compact, and not just for dogs! Sunblock: Alba or Badger make good organic sunblock. Treat your skin well! Camera: I use the Canon 5D MIV full frame camera, before that we had a Canon 80D which is great. Camera lens: I use a Canon 16-35mm f/2.8 for landscape and astro, a Canon 24-70mm f/2.8 for general purpose and portrait, and for telephoto shots of animals the Canon 70-200mm f/4 is a great lens.